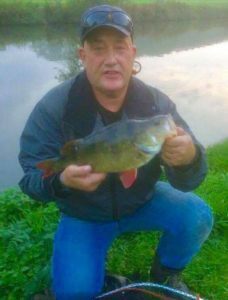 Club member Andy Willmore has been working with the EA to secure a significant grant to improve the habitat for fish and wildlife at Mote Park. Most of the money will be spent on planting lilies around the perimeter. I’m sure many of our older members will remember these were a prominent feature 30+ years ago when this was one of the prime Tench waters in the county. The work is scheduled to begin in April and if you’d like to be involved, contact one of the committee or Andy himself. Along with this grant, the club will be introducing 500 Tench and 1,000 Bream into the lake. This season has seen specimen Perch being caught in numbers throughout our stretches of the River Medway. Match and pleasure anglers alike have been tempting them on worm, maggot or lures. The finest example was this superb example at 4lb 8oz caught on a 6″ lure by Phil Sammells. Fishing has generally been slow over the last few months here but the one bright spot was the Demelza Charity match which raised over £6,000 for this great cause. Thanks to all that organised, took part and contributed prizes. A number of our members appear to have a problem with casting into the water at this venue, with numerous lines strung from the overhead power lines, one with a seagull attached which has presumably eaten the bait and died up there. The island is also a haven of leads and feeders which are a hazard to the large population of birds and ducks. Please show a little more care. We were well represented at this years Kent Championships on the Royal Military Canal but finished runners up once again in the team event. However, many of our anglers won section money and Bryony Baker won the Ladies award. We will be hosting this event on The Medway next September. We have been forced to cancel matches on the River Beult due to excessive duckweed covering 90% of the swims. These will be rearranged as soon as the river is fishable once again. The club championship is heading for the closest finish for several years with Jon Overton leading a group of five anglers still in with a shout. The Christmas match is being held at Claygates fishery, details are on the forum. Please book in with the match secretary if you wish to fish.